WiFi will be the glue that holds our connected lives together. By 2025, what will change? One of the major shifts will be our increasing dependency on, and interaction with, data. Looking at the positives of this, it’s possible that we will become walking, running, sleeping data streams, churning out highly valuable, continually-updated metrics. This data will be at the heart of a thriving information economy. And artificial intelligence will help us do our jobs with greater speed and efficiency, to achieve better results. The number of connected devices we use will be off the scale, compared to today, as we see incredible growth of the IoT market, with 75 billion devices expected to be connected by 2025. Everything from cars to fridge-freezers will have the ability to collect and communicate data. Augmented decision-making will make technology less burdensome. We won’t have to think about whether we need to buy milk – your fridge will know you’re running out and will place an order. Another shift will be away from screens and towards multi-sensory communication. People will communicate in new ways, via wearable and possibly even physically-embedded technology. As an example, Elon Musk recently revealed his investment in Neuralink, a company that’s developing devices that can be implanted in the human brain. The idea is to help human beings merge with software to keep up pace with AI, improve their memory, and allow for more direct interfacing with computing devices. Following the trend lines, we will also see that the obsoletion of the wires and cords that once tethered our technological world. This is already underway, but with the continued development of technologies like Bluetooth and Wi-Fi, physical connections and the unsightly mash-up of cables in our homes and offices will become a thing of the past. Wireless charging will also bring about the end of clunky plugs and chargers. In the same way that today’s tech irritations include waiting more than a few seconds for a website to load, consumers will find it annoying and archaic to have to plug in a device. One casualty of technological evolution over the next seven years could be the mobile networks, which are already under considerable stress and pressure is continuing to mount. Data consumption will spike as unlimited plans will become commonplace; followed by the widespread deployment of 5G around 2020. There will be huge step-changes in the way we use our mobile devices, away from phone calls and texts, and towards music and film streaming and messaging apps. A report by Deloitte in 2016 found that 31% of smartphone users make no voice calls in a given week – compared to 4% in 2012. Similarly, following a peak in 2011, the use of texts in the UK has plummeted by almost half. Calls and texts have been overtaken by instant messaging through apps like Facetime and WhatsApp. Netflix and Spotify bingeing, YouTube watching, Fitbit analysing, central-heating controlling, dating, shopping, ordering take-out – we run our lives through our mobiles in a way that was unimaginable a decade ago. The smartphone has a very different role to play in our lives than the first generation of mobile phones. The cellular networks may fail to hold up under the pressure. As it stands, they already rely on being able to offload data onto WiFi. In fact, more traffic was offloaded from cellular networks on to WiFi than remained on them in 2016. As we enter the Zettabyte era, with annual global IP traffic expected to reach 3.3 ZB per year by 2021, they will depend increasingly on WiFi to take more of the strain. We agree that WiFi is a robust technology – continually evolving and capable of stepping up to the challenge of insatiable data consumption habits of individuals, businesses and government. The global WiFi market is consistently growing. With an estimated CAGR (2015-2020) of 17.8%, it is expected to be worth $33.6 billion by 2020. It’s amazing to think that there are already almost 12 million commercial and community WiFi hotspots in the UK, with the majority offering free access. This year (2018), it’s expected that there will be one WiFi hotspot on the planet for every eight humans. Where mobile may struggle in the coming years, WiFi is poised to meet the demands of our changing society and consumers. 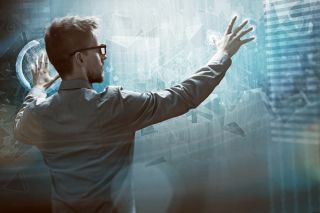 Increasingly, it is the glue that holds our connected world together, satisfying the appetites of data bingers, for whom devices and wearable tech play an integral role in their lives. WiFi also offers significant benefits from a commercial perspective. For instance, venues can use a WiFi analytics platform to improve engagement with visitors and collect insights that can be used to empower marketing and strategic decision making. WiFi is an established technology with two decades of growth behind it, which is continually metamorphosing. It remains unsurpassed in terms of performance and ability to move large amounts of data. We’re looking forward to a bright future for WiFi.